Local mental health charity, Hull and East Yorkshire Mind, has appointed a new Chief Executive. 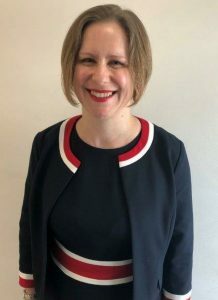 Rebecca Parker joined Hull and East Yorkshire Mind as Chief Executive in April 2019, following the departure of former Chief Executive David Smith in November 2018. Hull and East Yorkshire Mind is a local mental health charity which has been supporting people with their mental health for over 40 years. It provides advice and support for people living in the Hull and East Riding areas who are experiencing mental health problems, as well as campaigning for improvements to mental health services, and to reduce the stigma and discrimination many people face. Since graduating from Cambridge University with an MA in Law, Rebecca has worked for organisations in the public, private and voluntary sectors across the UK, in areas such as audit, contract management, compliance, and project and programme management. She has recently run her own business, working with clients on public health, social care and criminal justice related projects and programmes. Rebecca Parker joins at an exciting time for the charity which has grown and developed in the last 3 years. The profile of mental health and wellbeing has also increased locally, regionally and nationally, with Mental Health Awareness Week due to take place next month. Rebecca Parker, Chief Executive, said “I am passionate about mental health and our local area and was keen to return to the voluntary sector to use my skills and experience to benefit an organisation which positively changes people’s lives. I am proud to lead Hull and East Yorkshire Mind which plays a critical role in changing opinions about mental health in our local community, and has a great track record of providing advice and support to empower and give hope to local people experiencing mental health problems. I am looking forward to leading the charity through the next phase of growth and development”.